Peak Oil is an economic resource management game for 4-5 players where the choices that players make permanently impact the availability of resources in later games. Players invest in infrastructure, compete for resources, and attempt to predict an ever-changing supply of natural resources to try to fulfill unpredictable power demand. At the end of the ten rounds, the player with the most money wins, but the choices she made might leave her stuck the next time she plays! Peak Oil employs a ‘wheel’ drafting mechanic: each round, players have three chances to draft from a single pool of roles, resources, and technology. Starting with the first, player, each player picks one role, resource or technology card. After the last player picks, order is reversed and everyone picks again. Finally, this happens a third time. Roles affect the choices players make later in the round, but selecting them early means giving up other choices. Technology cards are power plants that provide power. Resources provide plants with fuel to make power. The game uses legacy mechanics to ensure that the players’ choices dramatically change the landscape of future games. Players who provide power via consumable resources must permanently rip up the cards they use. At the end of the game each player signs one of her power plants - she’ll start with it next game. Finally, when power plants' capacity to produce power is increased, they are increased permanently for future games. The resource deck has only 5 types of cards — sun, wind, coal, oil, and nuclear material. The tech deck is composed of power plants of the same 5 types. Each plant is unique, and has 4 levels of upgrade. During the game, players upgrade plants they own by crossing off the current upgrade level with a marker, permanently changing the card. Early upgrade levels require small amounts of fuel to produce power, and higher levels require more fuel to produce larger amounts of power. High-level plants can result in not being able to provide the minimum required fuel. Each level also displays the number of consumed fuel resources that are destroyed when used. The dice are used in combination to determine the power demand at the end of each round. Each die is different to provide excitingly unpredictable probabilities. The Red Die has 0 and 1 on its sides. The Blue Die has 2 and 3, and the Green Die has 4, 5, 6. Each round has a specified combination of dice to roll, with increasing values throughout the game (Round 1’s demand: Blue Die - Red Die. Round 7’s demand: Green Die + Green Die). Money is given out for being able to provide power that meets the demand. Players who meet the round’s demand receive one token for each power supplied. Rachel, Helena, Kristine, and Martin are on the 7th round of play. Rachel has the least money, so she begins. She flips over 10 resource cards (which happen to be 2 of each type), 3 plants (two solar and a nuclear), and adds the 4 role cards. Rachel drafts the “Surplus” role card, hoping to get 2 coal and 1 oil next turn for her plants. Helena takes 1 coal. Kristine takes the other coal. Martin takes a nuclear material, and then a nuclear plant for his second pick. Kristine knows that she won’t be able to fulfill this round’s demand (which is 8-12), so she picks “Batteries” in order to save some renewable resources for next turn. Helena takes “Upgrade,” and upgrades her coal plant one level to be able to produce 9 energy from 3 coal (which she has saved from last turn). Rachel, foiled, uses her “Surplus” card to take 1 oil and 2 sun resources. Rachel takes the the solar plant as her third and final draft. Helena takes “Efficiency.” Kristine takes a wind resource. Finally, Martin swipes the final nuclear material. The dice combination rolled for this turn is (according to the track): Green Die + Green Die. The first roll shows 6, the second shows 5. Players are challenged to produce 11 power. Rachel does not have enough resources to make 11 so she discards her 2 sun cards (as renewable resources cannot be saved), and her turn is over. Helena uses her “Efficiency” card to roll the Blue Die (resulting in a 2), and then trades in 3 coal to her plant to make the requisite 9 power (11 demand minus 2 efficiency), which she redeems for 9 money. Kristine uses “Batteries” to save her wind resource, plus the two she saved from last round - next round will be big for her. Martin turns in his 2 nuclear material for 6 total power. He then turns in 3 oil he has been stockpiling to a low level oil plant for 6 more power. He meets the demand of 11 and gets 11 money tokens. One of his power is wasted. Rachel still has the least money, so she begins the 8th round. 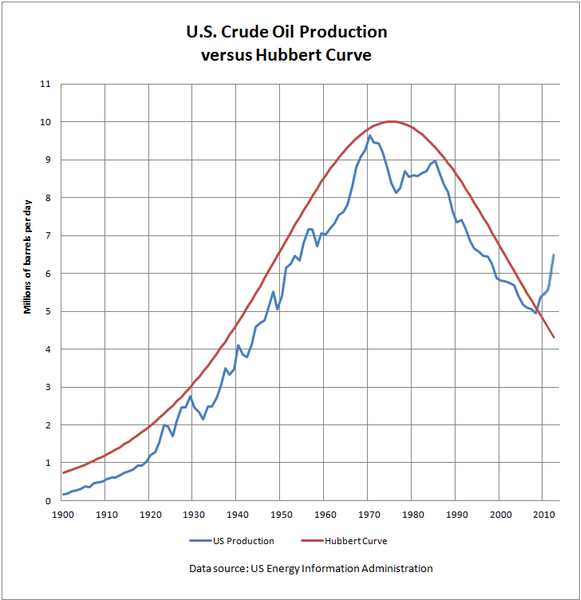 Peak Oil is named for the widely supported theory that civilization has already harvested the majority of the Earth’s oil reserves, and that the year of peak oil production already occurred in 2000. Each year sees fewer barrels of produced oil, due to decreased natural availability. Through its permanently decreasing reserves of consumable fuel cards, Peak Oil conveys the value that consumption of fossil fuels is economically and socially unsustainable; but the solution isn’t an immediate switch: sustainable energy technologies must be developed to shoulder the burden.